Energizer's USB Charger | OhGizmo! The Electric Bath Duck – Cool Gift Or Suicide Helper? By David Ponce on 05/03/07 • Leave a comment! Seems all the cool kids these days are plugging into USB. Whether it’s heating your coffee, or sucking your cigarette smoke, USB powered gadgets are all the (admittedly geeky) rage. 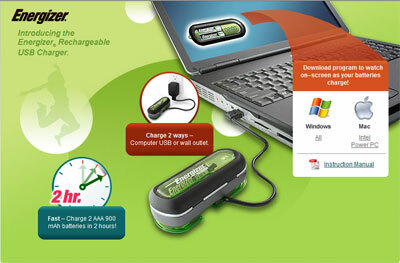 That’s why it’s no surprise to see Energizer jumping on the bandwagon with its USB Battery Charger. It does pretty much what you’d expect a charger to do, but it adds a few options. You can charge either via USB, or from your wall plug. And, should you be terribly fascinated by the charging process, you can download a little piece of software that will let you see in real time (on your PC or Mac), just how much juice has been transferred from your computer to your batteries. It seems to retail for about $14, and comes in three colors: red, green and blue.